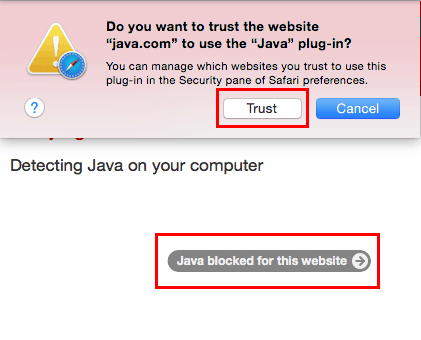 The security threat from web browser plugins like Flash and Java seems to ebb and flow. If you are like most people, you may not be ready to completely dispense with using these technologies altogether. Yet, as a security-conscious individual, you realize that plugins may always represent a continuous threat. Learning how to enable click to play plugins in your web browser of choice may provide a happy medium. It allows you to continue to readily access plugins and the content they enable, but to trigger their use only when you choose to activate them. Apart from improving your security online, some added benefits of enabling click to play plugins may be improved computer and web browser performance, reduction or elimination of banner ads and pop-up windows, and improved battery life. The method for enabling click to play plugins varies from browser to browser. Fortunately, each of the major web browsers provides a means to easily configure click to play plugins. Below is how to enable click to play plugins in each of the major web browsers. 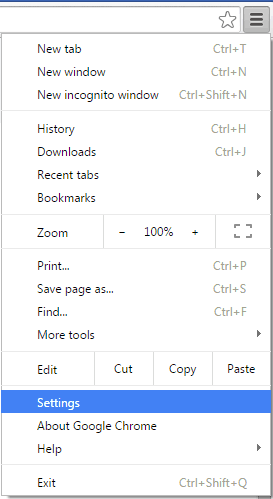 Click Google Chrome‘s Menu button next to the address bar field, and choose Settings. Scroll down to the bottom of the Settings page, and click the Show advanced settings… link. When the page expands to display advanced settings, scroll down to the Privacy section, and click the Content settings… button. A new window will launch. In the new window, scroll down to the Plugins section. Click the Let me choose when to run plugin content radio button, then click the Done button to save the change. 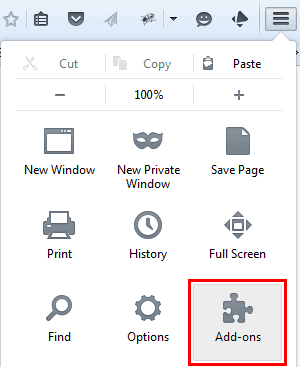 With click to play enabled, you will encounter a puzzle piece in your web browser in place of the plugin content. Right-click in the plugin area, and a menu will display. Choose Run this plugin to display the plugin content if that is your choice. In our screen shot below, we encountered Adobe Flash Player content. 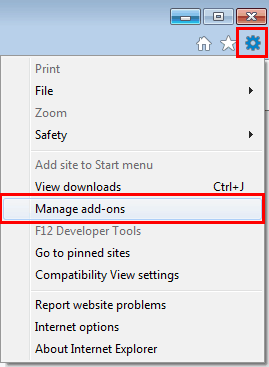 To manage plugins in Firefox, click the Menu button in the web browser’s tool bar area, and click Add-ons (or type about:addons into the address bar). Click the Plugins tab in the left navigation. Search the list of plugins for the individual one(s) you want to set to click to play. 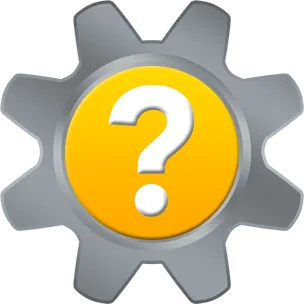 Click the menu next to the plugin, and choose Ask to Activate. 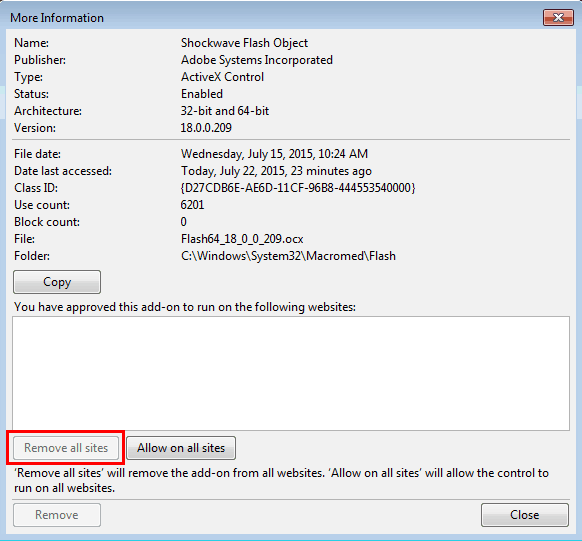 Our example below shows the configuration of Shockwave Flash (which is Adobe Flash Player) for Ask to Activate. When you encounter the plugin content in Firefox, it will be replaced by a gray box with a link to activate the content. In this example, a link to Activate Adobe Flash displays instead of the Flash content. Click the Activate Adobe Flash link, and a dialog will display. Click the Allow Now button to choose to run the plugin this time only, and the plugin content will then display. To manage plugins in Internet Explorer, click the gear icon in the tool bar area, and select Manage add-ons. The Manage Add-ons window will launch. Under Add-on Types, click Toolbars and Extensions. Under Show, select All add-ons. A list of all add-ons will display. 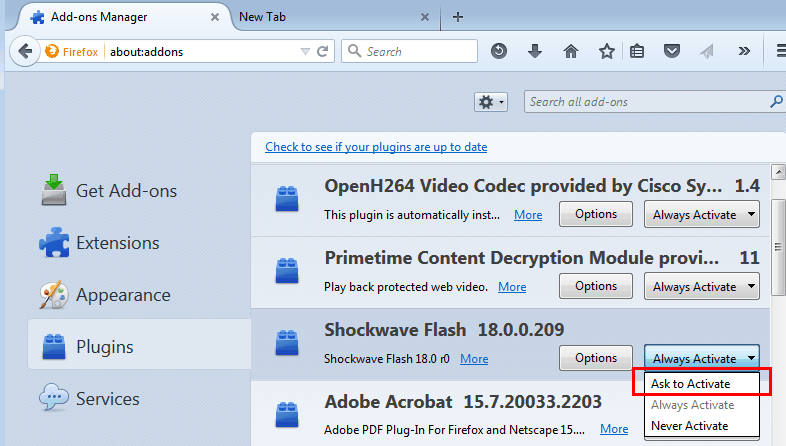 In this example, we searched for Shockwave Flash Object (which is the Adobe Flash Player plugin) located under the Adobe Systems Incorporated section. 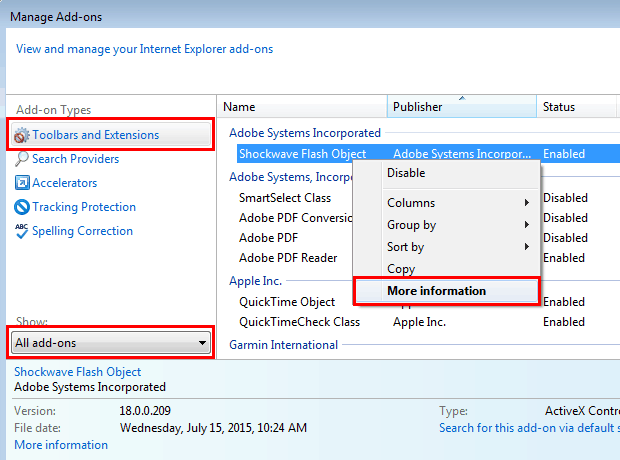 Right-click on Shockwave Flash Object, and select More information from the drop down menu. The More Information window will launch. Click the Remove all sites button, then click the Close button. When you encounter the plugin content in Internet Explorer, a notification bar will display at the bottom of your web browser window. In this example, we encountered Adobe Flash Player content. Click the Allow button in the notification bar to run the plugin content that time only. Plugins are managed in Opera by clicking the Opera button, and selecting Settings (or type opera://settings into the address bar). 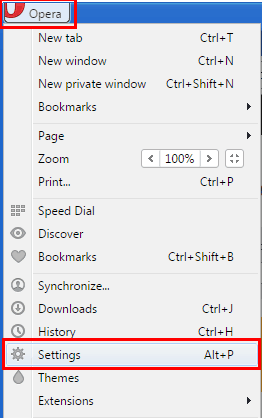 In the Settings window, click Websites in the left navigation, and scroll to the Plug-ins section. Click the Click to play radio button. When you encounter plugin content in Opera, a gray box will display with a Play icon. In this example, we encountered Adobe Flash Player content. Click anywhere within the gray box if you choose to play the plugin content. 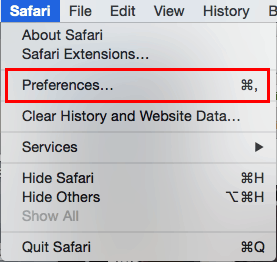 To manage plugins with Safari on Mac OS X, click the Safari file menu, and select Preferences. In the Preferences window, click the Security icon. Click the Website Settings… button next to Internet plug-ins. In the Website Settings window, choose the plugin you want to manage. In our example, we selected Java. 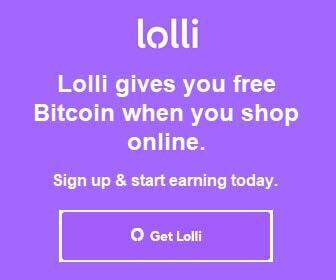 Choose Ask for When visiting other websites, then click the Done button. When you encounter plugin content in Safari, a notification will display in place of the content. In this example, we encountered Java content. To display the content, click the notification, and click the Trust button to trust the particular web site you are visiting to display the plugin content. Thank you for visiting Tech Help Knowledgebase for learn how to enable Click to Play plugins.